Discussion in 'Forza Motorsport 7' started by GTPNewsWire, Feb 1, 2019. This article was published by Kyle Patrick (@SlipZtrEm) on February 1st, 2019 in the Forza Series category. That soon!? Great! Looking forward to it. 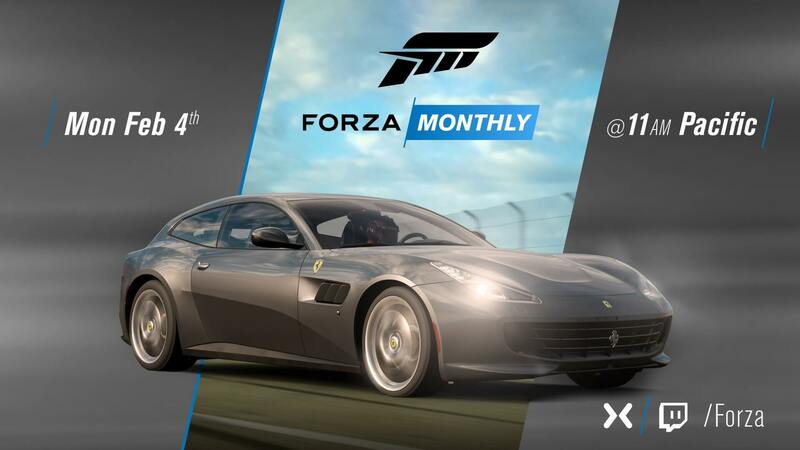 I love these Forza Monthly stuff because exciting things always come out of them haha! Also the new Ferrari GTC4Lusso is coming to Forza 7!! I was gonna say, considering you can also see the racing driver model in the GTC4, chances are it'll be heading to Forza 7. In which case, if some cross-game DLC is going on, I may just have to pick up Forza 7 after all. Also the track fences. There's nothing like them in FH4. While I have basically zero interest in that specific Ferrari coming to FM7, I do like the idea that it could be the start some transfer between the games if that is what we are getting. Hopefully they will have some changes for FM7 this time around since the last patch did nothing other than add the (terrible) DLC... Like drafting fixes please! OlegMarkaryan and 53Nicolas like this. Looking forward to the segment with Chris Esaki. Hopefully we will see and learn more about Race Regulations, and hopefully the tire barriers are either optional or they go away. Also, updates to FM7 are always welcome. CTstryk and OlegMarkaryan like this. Good thing I got a 25$ xbox live card to spend for Forza Horizon 4, otherwise I'd have to open my wallet and remove its info from online afterwards each week for the new cars, unless they have something else planned. Maybe a teaser for FH4 DLC2? Sure would be sweet! ClydeYellow and Nacho Libre like this. The GTC4Lusso will get a warm welcome in my FM7 garage. I don't really like the car that much but it fits in next to the FF and 612, so that's great. I wonder what the last 2 car pass cars for Horizon 4 will be. The Lusso is a good addition to this game. I don't like the FF and find it terrible to drive. I imagine the newer one is better. I don't want it as the Spotlight car, though. A race car would be preferred. It's gonna be Exotic GT like the FF but the divisions are slowly hindering this game. I don't find the Free Play mode of FM7 very enjoyable TBH, it's buggy. It doesn't auto upgrade AI like FH4, AI isn't drawn from your Friends poll, AI designs don't work, can't pick starting position, can't pick time of day... To race class I'm forced to go online or do time attack and that's not what I want. Last moth we had a race car in FM7 and everyone wanted the road car, now the opposite...? Free play isn't buggy for me. You can race class ot PI based by selecting not determined in the division. Noticed that divisions is what every other game, that is known for better cleaner racing than FM7, has? I don't get the negativity around divisions. Looks like the 599XX Evo is coming. ClydeYellow and CTstryk like this. We have 599XX already in FM7 and "The 599XX Evoluzione is an upgrade package for the 599XX, sporting an additional 20 hp and aerodynamics upgrades"
Meh. But what about GTC4Lusso? Ahahah Yes I am serious . "Everyone" suddenly became "so many". That's the thing, there will always be opinions deviating from a consensus, so your dramatic response above was hardly fair. I was under the impression it was the vast majority of the coms. But I agree with you everyone, is rarely accurate when used litterally. Am I wrong to think the GT4Lusso doesn't belong in "Exotic GT", because it's a 4 seater??? Ferrari FF is Exotic GT and Ferrari 612 Scaglietti is Sport GT Icons, both are 4 seaters. Both are pure grand tourer cars. Okay. I was thinking it'd be more of a luxury car. But hey, you guys are more experts than I. Thanks for your input!